Let´s talk about the new OPL4 SHOCKWAVE 2. The OPL4 SHOCKWAVE 2 is smaller than your predecessor and fit in a small cartridge case. The OPL4 sound is mixed with the internal MSX sound. 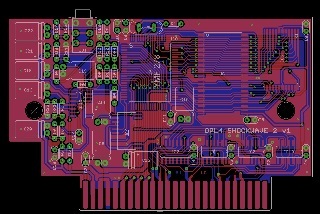 In others words, you can listen the OPL4 SHOCKAWAVE 2 sound throug the MSX sound output (mono). The OPL4 SHOCKWAVE 2 have twice capacity of RAM of the original OPL4 (2MB against 1MB). 1. We will post here on the site the list of buyers in the order in which we are receiving payments. So everyone can follow the progress. This update can take up to 48 hours to complete; Check the list in the end of this post!